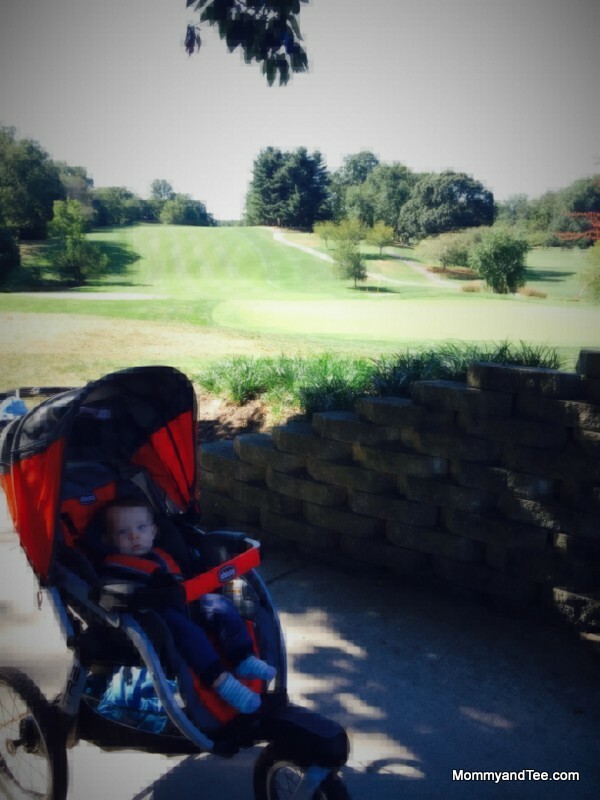 Mommy and Tee: So what do you do with the baby while you golf? So what do you do with the baby while you golf? I push him in his stroller while I carry my bag. It torches calories. In no time I'll lose those last pesky pounds of baby weight and I can go shopping for new skinny jeans and bikinis for summer! I dress him like one of the caddies at Augusta and it's SO cute. He really enjoys the scenery and it's so much fun to spend time together. Just kidding. Sort of. I have definitely thought about doing that. When he was younger, like around 6-8 months, he would easily nap in his jogging stroller and was never very vocal. So had my back been healthier (pregnancy does a number to you!) and had I had not spent my time moving cross-country, he would have been the perfect playing partner. But now, at 16 months, he's movin', shakin', and vocally, vehemently, against sitting for longer than an episode of Sesame Street (the HBO kind which is shorter than PBS). So while I can't wait to get him out on the course and show him all that entails, that's going to have to wait. (And I'm still very serious about the caddy outfit). I write this fairly boring post to hopefully illustrate how tough it is to secure quality child care for anything, let alone something as non-serious as golf. Although there are some fancy schmancy clubs with daycare rooms, we can't manage those kinds of luxuries -- so hourly care it is. A full round of golf can take up to 5 hours at some courses (or more, 9 holes a few months back at a local public course took four hours alone!). Depending on where you live, childcare can easily be $15 bucks an hour or more, and that's for just one kiddo. Tack that on to ever rising greens fees and it can easily wipe out a family's budget. But I'm not willing to wait until he (and whatever future nuggets I may have) are school-aged to get in some rounds. I looked at the websites like Care and Sittercity. On top of what I would have to pay the sitter, there is a monthly fee, and I wasn't entirely confident in the reviews concerning their background checks. But over the past several months of living in our new city, we've gotten to know our neighbors very well. I'm very good friends with one who also stays home with her daughter who is just a bit older than mine. She's an artist who has a home studio, and we talk often about our interests and work as a core component of our identity and how we so much miss being able to do those things full time and yadda yadda yadda a little bit of self pity and whining about stay at home mom life with a confidant. She's also GREAT with my kid, and knows how hard I've looked for a babysitter being new to this city. So, she did me a huge one and offered to help me by watching him while I golf! We've worked out a trade of sorts. I am paying her for each hour, but we deduct any hours that she might need. So last week, she watched mine, and this week I watched hers. Win-win. Thankful to have made some friends and earned a bit of luck in this department!